This review is a little unusual, because it is about a movie that was released 17 years ago: The Lion King. The movie is now out on Blu-Ray this year and, as a result, is being re-released in theaters for a limited time in 3D. When the movie originally debuted, I was 7 years old and living in Chicago; now I am 24. Does the movie stand the test of time? Read on to find out. The plot summary, in case you were born after '94 or have been living under a rock for the past 17 years: Simba (Jonathan Taylor Thomas when young; Matthew Broderick as an adult) is born to the lion king Mufasa (James Earl Jones) and Sarabi (Madge Sinclair). He is in line to inherit the throne, and his uncle Scar (Jeremy Irons) isn't too happy about that, because previously Scar was second in line to the throne. 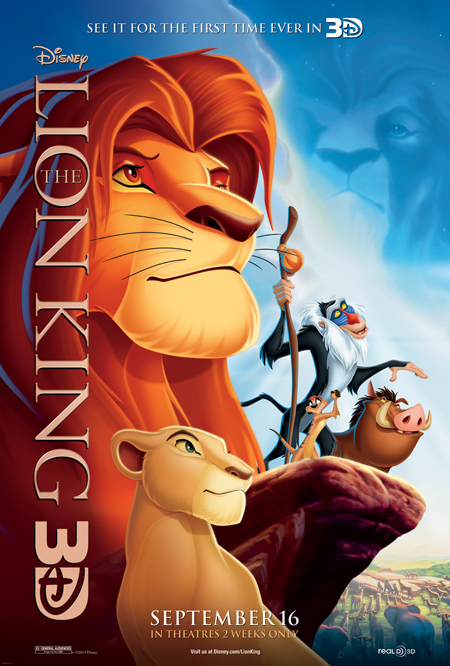 Scar enlists his hyena friends to kill both Mufasa and Simba, but only Mufasa is killed; he makes Simba believe it's Simba's fault, and tells him to run and don't look back. Simba is lucky enough to find two friends, Pumbaa (Ernie Sabella) and Timon (Nathan Lane), and he grows up with them by his side. When Simba's former best friend Nala (Moira Kelly) stumbles upon him one day, she is shocked to find him alive, as Scar told everyone that he died with Mufasa. Nala implores Simba to return to Pride Rock and take his rightful place as king, as Scar has ruined the kingdom and everyone is starving. Simba decides to return and confront his uncle and save Pride Rock from ruin. Assuming that most people have seen Lion King at some point or another, the real question is whether it's worth paying extra to see the film again in 3D. The answer is yes. Sometimes the 3D was actually TOO much - in one scene, Scar leaps out of the screen into the audience, almost - but for the most part, it is decent. Disney knows how to make movies, and Lion King is a classic; to see it in 3D only enhances the experience. The movie wasn't as "epic" as my 7-year-old self remembered it to be (though to be fair I've seen it once or twice since then too), but it still has catchy songs that the audience will want to sing along to (does "Hakuna Matata" ring any bells?) and the ending provides a satisfying conclusion to the film. The Lion King 3D is out in theaters today, September 16th, and is rated G with a runtime of 89 minutes.